I’ve recently become involved in two campaigns to help Music Education… what better time than now? For well over five years, I’ve been providing free services to musicians, educators, and folks seeking technology information and integrations -supporting music on a shoe-string budget is not only something I’m familiar with, but something you all are as well. Often chances like these come and go and we think “Wow, I wish I would have helped out or took the time to be a part of that”. I’m asking you to NOT be “that person” this time around. With regard to supporting music education, I’ve found that many folks will “talk the talk”, but often don’t “walk it”. I’m encouraging everyone that reads this post to consider helping out, TODAY -Right NOW, to two great causes that are actively campaigning for your help and for Music Education! One of the causes takes a mere MOMENT of your time and the other asks for any size donation that you can manage. This donation will go toward providing a FREE and incredibly useful service for ensemble directors everywhere… Both are worthy causes and certainly worthy of your consideration and time. First, MENC has an incredible shot at getting $25,000 from the Chase Community Giving project on Facebook. 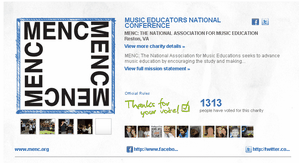 It looks as though we may indeed WIN this one for Music Education! But, we still need your support and we are really going to need it as MENC gears up for the $500,000 grand prize! Think of how much this will benefit Music Education, Educators, and Students everywhere! You can bet on it — I will continue to campaign for them and Music Education in the upcoming final round and you should too (read my first post about this campaign here). Please vote for them right now, it only takes a second, let’s RAMP this up to over 1,500 votes this round and get a STRONG army of grass-root Music Education supporters ready to take up the mantle for the $500,000 prize for Music Education in round two! Don’t wait another second, click it and vote now -it only takes a few seconds! The opportunity to take iSchoolBand to the next level as iSchoolMusic and make it free to every single ensemble director everywhere! The folks behind iSchoolBand truly believe in Music and Arts Education and have recently started a campaign that, if successful, will provide this incredible software free to all schools everywhere -no strings attached. I’ve written about and championed the product iSchoolBand from the first day I heard about it. I’ve written about it many times, right here, on MusTech.Net. It is a fine product and beyond useful for ensemble directors and music students. iSchoolMusic has started a campaign known as the “Innovate Music Education” Campaign and I strongly encourage you to check it out and donate to their worthy cause — skip the “McDonald’s” one day and donate anything you can manage to the campaign. Music educators often talk about how no one is doing anything for them… here is another opportunity to do something about it! Take a few minutes and “dig deep” to give to this great and innovative cause for Music Education… if they make their campaign goal, you will have provided an invaluable tool for all music ensemble directors everywhere… especially for those that can’t afford something like this. A small amount of charitable people can blaze the path to provide this amazing product for all people… think about it! 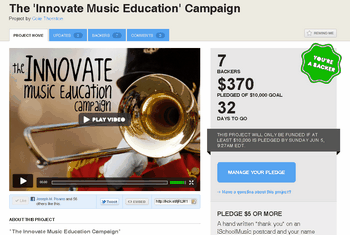 The Innovate Music Education Campaign! Mission: To make music more accessible to young people and logistics less time consuming for directors. Our project is to build a free and open learning management system for school music ensembles. Our team is made up of band directors and tech geeks who are passionate about music education. We have already built 70% of the core platform for school marching bands, however choirs, orchestras, and other ensembles need it also! School budgets are low, but the workload for directors is heavier than ever. We decided the greater good would best be served if this innovation were made available for free. This project is to allow our team (5 ppl) to spend 4 full months without other jobs so we can finish the software and always keep it free. Everyone will have access to iSchoolMusic absolutely FREE for LIFE!! Please help me out and help music education out by assisting in anyway possible to these two great campaigns! I hope you’ll join in with me today!